Apple finally released the much anticipated iOS 7 last Wednesday, September 18th. A lot of people are rushing in and updating to this latest version. It hit 18% adoption in just 24 hours after its release. I gotta admit, I love the look and feel of it and it feels like a completely new phone in my hand. In this blog post I have tried to explain some of the new and modified security settings, features that you should be aware of before you move to iOS 7. Just one day after its release, iOS 7 lock bypass flaw was identified by a user as show in this video. I tried it out on my iPhone 5 running iOS 7 and it is a fairly simple trick. This was followed by a similar flaw that was identified in the beta version of iOS7 sometime back. May be a good reason to not jump to iOS 7 right away? Until an official fix is released by Apple you can disable access to the Control Center from locked screen as discussed below. Yet another bug allows an attacker the ability to bypass the lock screen and make calls. Siri gains more power in iOS 7, maybe too much power. This vulnerability identified that while certain Siri commands are restricted (disallowing the user to post to facebook) there are alternate commands that accomplish the same task but are unrestricted. Latest iPhone models include a fingerprint reader called the TouchID. The intention behind this addition was in the right place, but as shown by the CCC, fingerprints should not be used as a security identifier. Hacking the TouchID got tons of attention from security community due to a crowd funding venture, however it appears that a fraudster named Arturas Rosenbacher took much of the credit for the venture, made false promises, and never paid up, creating a little drama in the industry. Notification center which was first introduced with iOS 5 gets a facelift with iOS 7. One of the key security distinction this time around is that you can access the notification center now from a locked screen. Notification center is a hub of information ranging from calendar, reminders, stocks, missed calls, messages etc. Unless you have a very good reason to keep it accessible from the locked screen I recommend disabling it. To disable it navigate to Settings > Notification Center. Toggle “Notification View” and “Today View” to off as shown below. With iOS 7 Apple has introduced Control Center, which lets you access frequently accessed settings by swiping up from the bottom of the screen. This feature, similar to the Notification Center, is accessible from the locked screen by default. It lets you modify settings such as Wi-Fi, Bluetooth, Airplane Mode, Airdrop etc. Again, it is recommended that you disable this feature from the locked screen. As shown in this video, having control center accessible from the locked device can let anyone in possession of your iPhone bypass the lock screen completely. This is another very good reason to disable access to it from the locked screen. You can disable it from under Settings > Control Center. Toggle “Access on Lock Screen” to off as shown in the figure below. With OS X Lion Apple introduced a new peer-to-peer file sharing feature called Airdrop for the Mac users. This feature is now also made available to the iOS 7 users using iPhone 5 models. This feature lets you transfer maps, pictures, videos using Wi-Fi and Bluetooth to other users in close proximity. One of the settings for Airdrop is that it lets you choose whether your iPhone can be discoverable by everyone or just your contacts. It is recommended that you select “Contacts Only” as it is a safer alternative than “Everyone”, unless you want to receive file sharing requests from anonymous people around you. iOS 7 introduces a powerful version of Siri with additional commands that lets you change settings on the fly from locked screen such as “Enable Bluetooth”, “Turn on Airplane Mode”. You can also find recent tweets, post on Facebook, read and reply to new messages, view missed calls, and listen to voice messages etc. from the locked screen using Siri. It is recommended that you disable access to Siri from a locked screen. To do so, go to Settings > General > Passcode Lock and disable Siri and other settings as shown in the figure below. This is one of the nicest security feature that Apple has introduced with iOS 7. 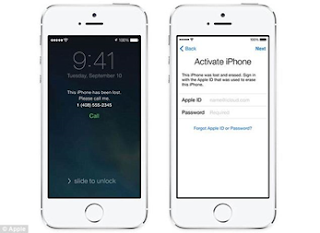 In an attempt to prevent thieves from reselling stolen iPhones by just resetting them and swapping the SIM card; Apple introduced this feature called “Activation Lock” to augment its Find My iPhone service. This feature prevents someone to erase all the data and re-activate the device, or turn find my iPhone off without entering the Apple id and the password first. When you first upgrade to iOS 7 Apple asks for your Apple id to enable this feature. To enable it at a later stage simply go to Settings > iCloud > Toggle Find my iPhone setting to on. To read more about this topic, visit this post. iOS 7 now asks for user’s permission if an application intends to access the microphone. In the previous versions of iOS permissions were limited to contacts, calendars, photos etc. This is a new and nice privacy control. You can see which apps have been authorized to access the microphone and revoke access by going to Settings > Privacy > Microphone. The “Private” browsing setting has been moved out from the “Settings” and now more easily available within Safari. You can easily enable “Private” browsing by navigating to bookmarks in Safari and tapping on the “Private” button on the bottom left corner. Moreover, you can also disable all tracking by going to Settings > Safari and turning “Do Not Track” button to off. This feature lets you limit ad tracking and reset your device’s “Advertising Identifier”. This prevents companies from sending you targeted advertisements through a unique tracking number tied to your device. To enable this option go to Settings > Privacy > Limit Ad Tracking and turn it on as shown below. When you first upgrade to iOS 7 it asks you if you want to remember places that you frequently visit. If you opt-in, frequent locations setting saves this information and transmits it anonymously to Apple to improve Maps. There is no surprise here that iPhone keeps track of places you frequently visit, if you followed the Location-gate fiasco that unveiled in 2011, when a database of Wi-Fi hotspots was discovered on the iOS 4 devices. However, now apple is being more transparent about it and provides an option for users to opt-in. Good thing is this is turned off by default in iOS 7. It is no longer a developer-only setting, but a consumer feature according to Apple. If you opt-in by mistake and want to opt out then go to Settings > Privacy > Location Services > Scroll down to System Services at the bottom of the screen > Toggle Frequent Locations to off. With iOS 7 now you have the ability to block contacts for phone calls, iMessages and FaceTime. To block someone go to Settings > Messages or FaceTime and scroll down to “Blocked”. From here you will be able to add contacts that you want blocked as shown below.